My journey was long and dark, but after a precarious trek, I found myself on a faraway shore where a new Boneyard lay wait. Cautiously, I approached these so called “twilight beasts” and found them somewhat different from those that I have encountered from past travels. Covered in sharp bark like scales and writhing about with long tails, they clawed at the moon while slithering along the sandy coast. Wearily, I collected my nerves. Gently, I reached out with my mind, only to encounter a piercing howl that sent my head spinning. These creatures are suffering and I am the first person to hear their pain. And so, I decided to stay and listen so that one day I could tell their story. It's time to get back to my stories of the boneyards in "Boneyard Journeys." With a long exposure of almost two and a half minutes, a rising tide and fogging lens, I wasn't sure this shot was going to work. 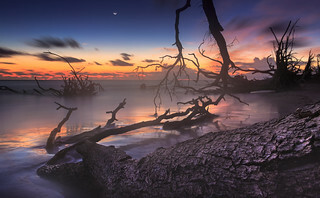 This is an introduction to a short series at the Boneyard Beach on Big Talbot Island, Florida. Wishing everyone a wonderful day ahead. Thanks for the favs and kind comments, they are much appreciated!